Apple has a new patented invention, and it is an advanced device that would be incorporated into a set of earbuds or headsets in order for them to be capable of collecting important data like body temperature and heart rate, among others. The device also appear to have a specific purpose since the patent calls it a sports monitoring system. According to the U.S. Patent No. 9,497,534, the monitoring system will be helpful in many ways, such as monitoring user activity when a user is exercising or engaging in sports activities. In addition, the device would also come in handy since it’s designed to control other electronic devices. Based on the official document, Apple has been working on this monitoring system for some time now. The first time that the Cupertino giant applied for a patent of this kind of technology was way back in 2007. The company moved forward by creating a patent continuation in 2008. The tech giant was finally issued the official patent for the invention in February 2014. All of which are referenced in the new patent. Back in 2008, Apple’s patent application specified that the sports monitoring system would be controlled by head gestures. However, PhoneArena has stated that the company may have realized how this manner of control would be inappropriate given that people would have to shake their heads left and right to control the device. Thus, Apple decided to come up with a revised version, and this time controls for the monitoring system rely on touch and voice commands. In the illustration provided as part of the document, the earbuds that are featured have wires, so it’s not surprising if one would come up with a conclusion that the monitoring system would be incorporated into the EarPods. 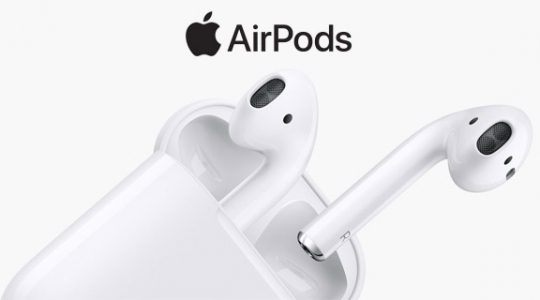 But AppleInsider believes this technology could actually be designed for the AirPods, since the wireless headphones already have some features that are detailed in the patent. Unfortunately, AppleInsider says the integration of the sports monitoring system into the AirPods would be technically difficult. Also, knowing how Apple is already struggling to manufacture the current AirPods devices, it would be unlikely for the monitoring system to be added into the mix anytime soon.